Prepare for an unforgettable experience of the Australian Outback's vast blue skies, rugged deserts and stunning scenery combined with its cultural and spiritual history. 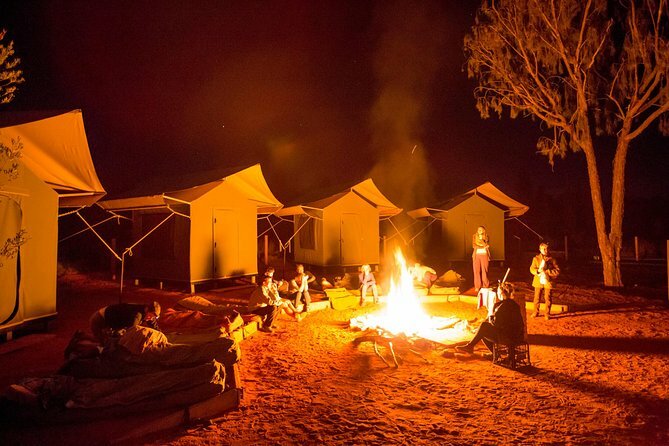 Travel in 4-wheel-drive vehicles specially built for the rugged terrain and off-road bush tracks of the Uluru-Kata Tjuta area, and spend all four nights camping at private bush camps, enjoying dinner cooked over the campfire and hearing the stories of how 'Dreaming' and 'Creation' began. Fall asleep in your swag (a water-resistant camp bed) after staring in awe at the magnificent desert sky with its myriad of stars. DO IT! This is one of those things that you don't want to say I wish I would have... Of all of the incredible and beautiful things that we saw, did, experienced, 2 things stand out. The morning of the last day was spent with Rhonda and Johnny, an indigenous couple that showed us how their people gathered food honey ants, grubs, wild onions to feed their people. An eye opening experience to be sure! The other thing was our guide Joe. Joe was great! Very knowledgeable, very helpful with everything and anything that happened, and he had a good feel for the mixture of our group. None of the chosen activities was out of reach of anyone in our group. Joe is the cosmopolitan dude he's as comfortable in bush sleeping on a swag as he is in a tuxedo conversing with intellectuals. Thanks Joe. Saw so much on this tour and the experience of camping under the stars in this environment was awesome. Our guide was very good not only in leading the tour but in preparing meals. Some of the 'walks' advertised were much more strenuous than anticipated so you need to check in with guide ahead of time to ensure you should be doing them. I managed and it was well worth it. The best day was spent with a language group chief who shared her culture. Great experience, impressive landscapes and Aboriginal sites adventurous to sleep in tents and swags again, well informed guide: on culture, history and geology - also an excellent cook and highly efficient. A great trip from start to finish. A small group of 16, myself 24, one other English traveler 28, two younger couples 28-30 and then everyone else in couples 40-65. Mostly Eastern European's Swiss, German, French. The group really bonded and by the end of the 5 days it was sad to say goodbye. The sights are great, but the group dynamics made the trip equally fantastic. So many fantastic sights, Uluru Ayers Rock, Kata Tjuta The Olges, Kings Canyon, Ormiston Gorge, all equally fantastic. Everyone knows about Ayers Rock, but the other sights are equally fantastic and not to be missed, this trip takes you to all. Final day, the opportunity to meet an local Aboriginal and have a guided tour of their land, very interesting and informative. Nick, the guide, had excellent knowledge, was extremely friendly and with limited cooking resources, prepared some fantastic and delicious evening meals. Accommodation is, for the first three nights, the option of permanently erected tents and the last night is a swag under the stars. There is basic shower facilities at campsites, which do the job required. Some early starts to allow you to complete the walks in the cooler part of the day, but the early start is more than worth it for the fantastic parts of land that you walk on and views that you see. All in all, a brilliant trip from start to finish, and is well worth going on to see the centre of Australia! I really enjoyed this tour and would happily recommend it. Our tour guide was wonderful and kept everyone happy with his enthusiasm, consideration, knowledge of the sites we visited, pleasant disposition, plus his organisational skills generally. We helped with food prep, clean up, firewood collection but nothing too onerous. We stayed at simple but well maintained private camp sites. 3 of the 4 had permanently erected tents, while on the last night we slept in swags under the amazing night sky. The group was made up of mixed nationalities and ages, and this worked well - I was a little concerned that I would not be fit enough (in my fifties in a sedentary job) but I managed the walks OK and I enjoyed the company too. This trip was over the top....GREAT! It couldn't have been any better. Our guide, Jenner (sorry dude if I mispelled your name! ), was exceptionally knowledgeable about history, geology, indigenous cultures, dream stories, plants, animals and birds. He is also an exceptional cook, cooking our healthy and fresh dinners over a nightly campfire. Jenner truely loves being a guide, cook, safe driver, and sharing his love and knowledage of the outdoors and of this particular part of the world....the Australian Outback, with fellow travellers. Jenner has a keen respect and knowledge of the aboriginal cultures. There were 13 fellow participants on this trip and we all felt the same way....it was a super special experience and Jenner had a lot to do with making that happen. Options were always provided for participants regarding length of hikes; accomodating everyone and being safe too. I just can't say enough about this trip, the tour company (Way Outback Adventures...I met the owner and told him how fortunate he is to have such a superb guide/driver), our guide Jenner, the accomodations (swags or tents), the quality of the food, and the itinerary. THANK YOU ALL FOR MAKING THIS AN ABSOLUTELY FANTASTIC TRIP! In spite of some mobility issues, my wife agreed to this because she knew how important it was to me to have a genuine outback experience. We knew that it would be hot and that one night we would not have the luxury :) of a tent. Even though we took face netting, we were not prepared for the black flies which are always around during the summer and, per our guide, worse than ever this year. They swarmed us every time we were outside. Fortunately they rested at night allowing us to as well. We are almost 70 so every thing took a greater toll on us. The younger folks took it better in stride. Take away 15 degrees and the flies and our trip would have been marvelous. We knew that we couldn't handle the long steep walks so we settled for shorter more level options. The tour company was great. Our first tour guide got sick and they replaced him with one that we all fell in love with. After two hot nights and three scorching days with flies we left the tour with the three day crowd. Facing two long walks on day four, it seemed our best option. We went back to Alice Springs booking two more hotel nights. The tour company worked with us and adjusted the day 5 itinerary to pick us back up for that days activities . The food was far better than we expected and the small group allowed us to get to know everyone. If you are young and/or energetic, do the 5 days but pick a cooler time. If you are old sissies like us, take the 3 day at a cooler time. Loved the company, guide and the experience . The tour was excellent. I liked the small group and the choice of places we visited. Our guide, Danny was super. I thought that the lunches could be better, the sheets made into sleeping sacks for easier insertion into the sleeping bags, and slightly more cleanliness in the dishware. However, we were camping and the group we were with was SUPER! This trip is a must for anyone visiting the Aussie Bush! Our tour guide Adz and his assistant K were perfect. They both had a great knowledge of the Bush and the Aboriginal people and made the trip even more fun. The trip is fast paced but that is unavoidable. Good tour were you visit beautiful spots and a nice guide. But we had some rain and the 3. campsite (were we stayed 2 nights) was not set up for that. The tens were already wet and were leaking during the night. Also the “beds“ were very uncomfortable. You rather sleep on the floor.The tour was adviced 5 days but we were back at noon, so it were only 4 1/2. Please note: You’ll spend three nights camping in permanent tents complete with beds, pillows and linen and one night camping in a comfortable swag (water-resistant camp bed) at a private bush camp. Respecting indigenous culture: Visits to indigenous sites may change at short notice, due to the cultural and ceremonial obligations of your indigenous hosts and guide. Uluru is sacred to the local Anangu Aboriginal people, and it is preferred that you do not climb it. Oak Valley Aboriginal Community may be substituted with an alternative indigenous experience due to cultural reasons and accessibility issues.